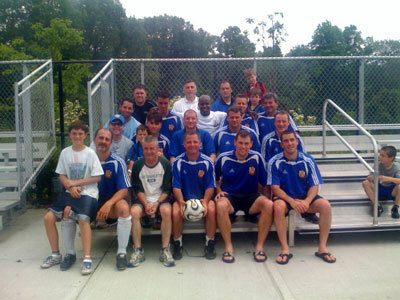 1988 The Senior Division team began participating in the Long Island Soccer Football League (LISFL). Starting in Division 3, the team was elevated to Division 2 when an opening occurred and then won promotion to Division 1. 1989 Garden City defeats Frozenone, a semi-professional team from Franklin Square, 1-0, on a goal from James Koester in a State Cup match. 1992-93 Season the Club is now in Division 2 and runs a reserve squad as well. The reserves win their division with a record of 12 wins, 5 draws, and 0 losses. The team records a streak of 24 games without a loss in League and Cup play. In the same season, the team reaches the League Cup semi-final before losing to the NY Rovers in a 5-4 shootout. 1993 Reach the Theiman Cup Final where they lose 3-0 to a strong Baldwin team; one of the team's biggest disappointments in Senior Division history. 1997 The program drops its Division 2 and reserve teams, and maintains only an 'over 30' squad. 1997-98 In a finish that goes down to the last game of the season, the 'over 30' team secures second place and is promoted to Division 1. 1998-99 After a season of many close matches, the results don't go GC's way and they are relegated back to Division 2. 1999-2000 The team is extremely competitive in Division 2 and is challenging for promotion again. 2000 Won promotion to LISFL Division 1 as champions. Pick-up game with everyone present are playes onSaturdays at 9:00 AM at St. Paul's School. Sundays LISFL home league games are played at 9AM- LISFL.Games are played from September to December and March to June.